behold I will smite all thy borders with frogs. Bake your cake in the Teddy Bear Pan. 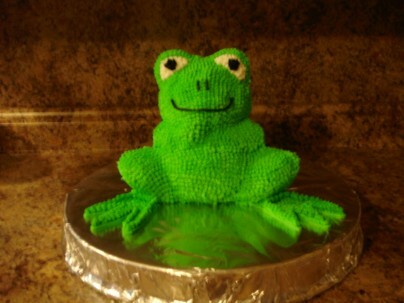 Color your white frosting green and pipe it on frog. Make him some feet on the pan cause he won't have any cause he's a bear, remember. His ears are his eyeballs. Put some white frosting for his eyes and black for pupils. Draw him a smiling face and two marks for his nose.